Hi, I really love your designs. I would like to build this design in cordwood. 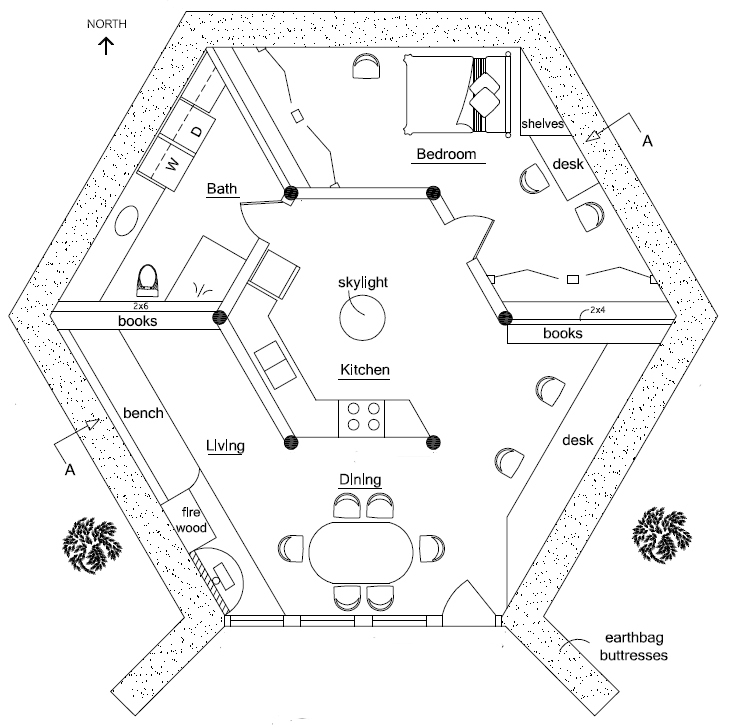 I was thinking of building above grade with a timberframe or [possibly even this floor plan below grade with a above grade smaller hexagon reading room with lots of windows. Would I be able to build this way with the plans as they are or would I need to have them redrawn. I live in the U.P. of Michigan with over 300 inches of snow a year and lots of sandy soil. Thanks. It mostly depends on your code situation. If there are no codes, then you can simply use cordwood where earthbags are shown. But in all cases I would build above grade to reduce risk of moisture problems. Then berm the earth up and over the structure. When all that snow melts, you don’t want it going into your home. So this plan is perfect for your area, especially if you have ready access to wood poles, which you probably do. what is the purpose of the stick wall? what would the the disadvantage to having it also be earthbag? I don’t know what you mean by stick wall. Are you referring to the south facing wood framed wall? That’s to make it easy to add lots of windows. It’s the only wall where sunlight can enter. You could add earthbags here, it’s just more awkward. Or use earthbags on the lower 2′ or so and build the wood wall on top. Would the wood framed wall be in-filled with earth bags? No, earthbags are shown as wide walls with dots. The south wall is 2×6 and insulated. Interior walls almost never use earthbags because they take up too much space. Several people have bought this plan, but most customers don’t advertise their project to the public. So I don’t know the progress on these projects. Genius as always Owen ! I wonder if this plan could be modified to resemble an Earthship ? They use big windows in the front to gather passive solar heat, and have a series of other systems. I get a kick out of Earthships but I don’t like the use of toxic tires. Other similar projects you might like include the Solar Pit house https://earthbagplans.wordpress.com/2011/09/16/solar-pit-house/ (free plan) and the Zero Energy house series. Search this Earthbag House Plans site for Zero Energy One https://earthbagplans.wordpress.com/2010/09/14/zero-energy-one-2/ and Zero Energy Two and Zero Energy Four. I have numerous adaptations of each. While other designers are charging more than $3000 for their plans – you enable those of us with modest means by providing free, and very low cost plans. The one I’m going to start with (Tinyville Domes) is only $100. Your book is free with a plan or only $20 without. Hi, I have to say that I really enjoy your designs . I plan to buy property in Northeast Ohio where I currently live, to build. Thus far this design seems to have alot of features that would be beneficial to the climate here. I do have a couple of questions however. 1. Is the timber framed southern wall suitable for strawbale? Or would that prove problematic for window placement? 2. I see a design that is this with domes attached, being that I live in a relatively wet climate would it be feasible to add a round room off of the main polygon shape, that’s bermed and under the living roof as opposed to a dome? I want a room suited to recording music, about a 16′ round, and I would probably Put it off of the bedroom section. The south facing framed wall has no room for thick straw bales. Use 2×6 framing and seal tightly and you’ll be okay because it’s just a short wall. A framed wall here helps with solar gain and ease of installing the door and window. Yes, this design is excellent for cold climates like yours. That’s the main intended purpose. Yes, you can add a roundhouse instead of a dome and have fewer moisture problems.